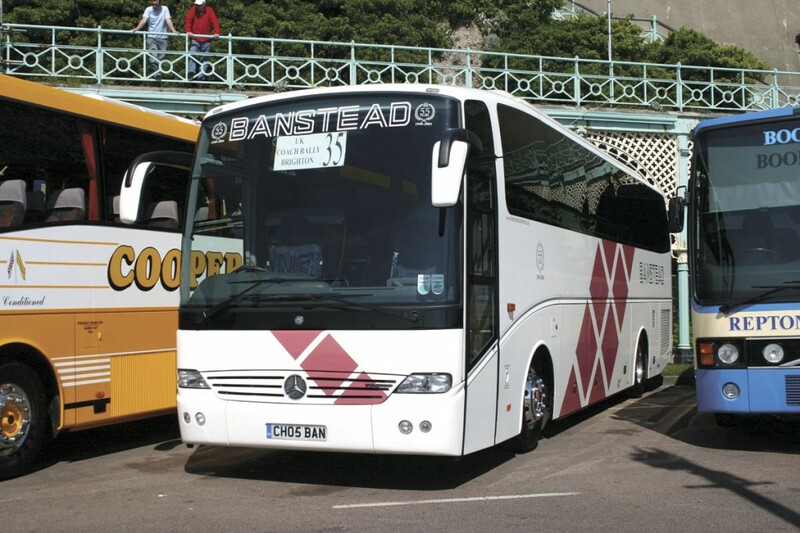 Mercedes-Benz is currently enjoying huge success in the UK with the Turkish built Tourismo integral coach but for many operators it was the earlier Touro model that laid the foundation for its achievements. There had been earlier full sized coach offerings such as the O.302 and O.303 integral, the Plaxton Paramount 3500 bodied O.303 chassis, a few Jonckheere bodied OH1836s and the Hispano Carrocera Vita bodied O.404 but it was perhaps the Touro, introduced in 2002 that introduced many current customers to the marque. Built in Portugal by Salvador Caetano, the body was mounted on the Mercedes-Benz OC500RF chassis assembled at the Samano/Castro Urdiales plant in Northern Spain that at one time manufactured the Setra S215HD Tornado. 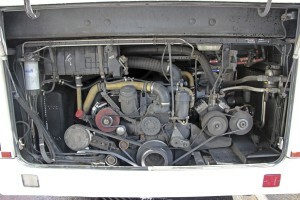 On the OC500RF, the six-cylinder, 12-litre, Mercedes-Benz OM457LA unit is vertically mounted in-line at the rear. Power generated was 354hp/260Kw and 1,750Nm at 1,100rpm. On Banstead’s trio the transmission was the ZF Ecomat fully automatic. Mounted on 295/80R22.5 tyres, it has a 400-litre fuel tank. After two blue interiors, Banstead’s opted for this terracotta colour for their third Touro and it has been specified for everything else bought new since. 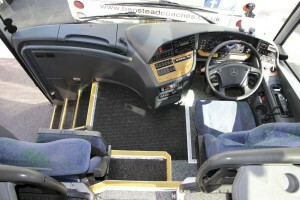 Surrey operator, Banstead Coaches, bought three examples new, all of which remain in their fleet. I visited them at their depot in Shrubland Road, Banstead, where father and son, Dudley and Matthew Haynes, together with some of their team told me about their experience with the model. 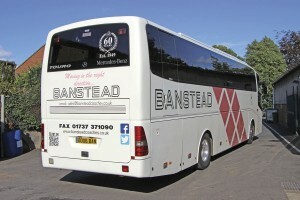 Banstead Coaches had traditionally bought new every year but had not previously opted for continental coachwork having consistently purchased Plaxton or Duple coachwork for decades previously. An exception had been two Van Hool bodied Bedfords, but even these had been the 300 model built in Ireland by Van Hool McArdle. Once a predominantly Bedford customer (the last Bedford left the fleet only recently), Banstead had moved to Dennis Javelins when the Luton built product ceased to be available. They subsequently bought three rear engined Dennis R-Series coaches, the first of them one of only two R300 models with Berkhof Axial bodies. The R-Series bought in 2002 had been something of a problem coach, encountering crabbing issues that took a while to be resolved, on top of which they thought that Plaxton’s prices were ‘going up and up’. Unhappy about buying more R-Series in the face of these difficulties Dudley and Matthew started looking around for the 2004 season. The cab and entrance of the 05. Matthew also went on a visit to the Caetano plant in Vila Nova de Gaia near Porto, Portugal, where he was made very welcome and was impressed with the way that the coach was built. As soon as the first arrived they were ‘as pleased as punch with it’, Matthew recalled. ‘It was like “wow”, we’ve missed out all these years. The luggage was as good as the R-Series and it was all underneath, it had an amazing steering lock, and it had the three-pointed star on the front which people loved. Having specified super soft seats on the advice of Simon Dew, it gave it that classy feel.’ It was quite a revelation after years of conservative specifications, ‘we only had air conditioning for the first time in 2000,’ said Matthew. A recent clear out of the office filing system, to make way for the mountain of paperwork modern day operation generates, meant that Matthew could not lay his hands on what the price paid for the first example bought in 2004 was, but he reckons it was around £10,000 less than the sum of £173,000 paid for a similarly specified coach the following year. Another to the same specification in 2006 set them back £175,000. In comparison, the first of two Tourismos purchased cost them £178,000 in 2008. In purchasing them, Banstead not only made the move to continental products, they also introduced the first fully automatic transmissions to the fleet. A factor at the time was that the R-Series was not offered with a full automatic, ‘only that horrible AS-Tronic box’ said Matthew, adding, ‘Our 08-plate Tourismo has the AS-Tronic and that has put us off for life. It fell to bits after 150,000km. It wasn’t worn out it just fell to bits.’ The gearboxes on the Touros are not automated manuals; they have a fully automatic ZF Ecomat six-speed unit. The 2005 Touro in the sun on Brighton’s Madeira Drive. 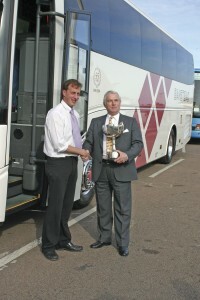 Matthew Haynes collecting silverware from Traffic Commissioner, Chris Heaps at the 2005 UK Coach Rally. The coach was new that year. 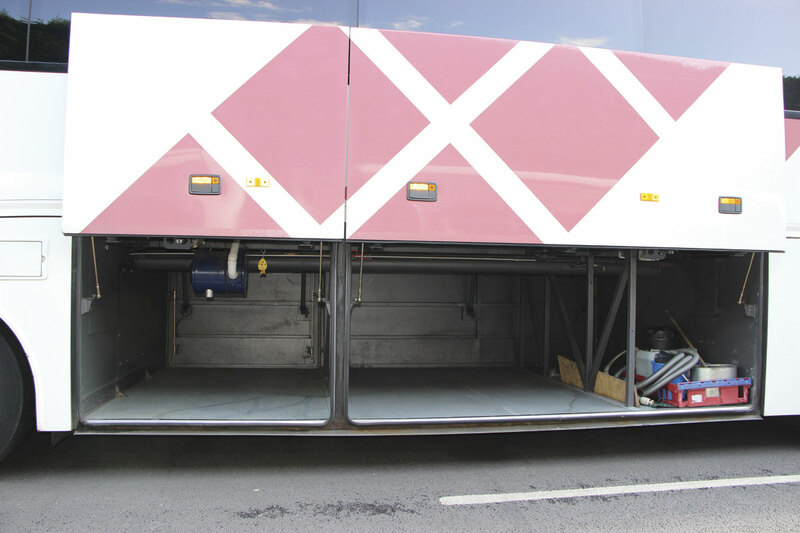 After finding that the initial coach attracted dust, a subsequent addition was a Smart vacuum system within the lockers to help the driver keep the interior clean. The first one fitted was rather badly located in the ceiling of the forward nearside locker where it constantly caught the driver’s head when loading, so the second two were mounted at the rear of the lockers. Though they are spacious, Matthew says that for choice he would not have had air powered units because they can go wrong, as he knows from experience. There have been issues with the micro-switches failing and the lockers opening or failing to close as a result. Matthew remembers an embarrassing incident at Wimbledon one year when he was carrying professional players eager to get to their matches. They wanted their rackets and he couldn’t open the flaps to get them, eventually managing to partly open a locker on the opposite side of the coach, climb in and hand the equipment across. The company has always found it difficult to find moquettes that match the livery and all three Touros have different coloured interiors. The first was trimmed in dark blue, the second in light blue and the third in terracotta, which has been the fleet standard ever since. Another policy is that there is one driver per coach (most of the time). Dave Brown, Dudley’s brother in law, was allocated the 05 plate Touro when it was new and has kept it ever since. 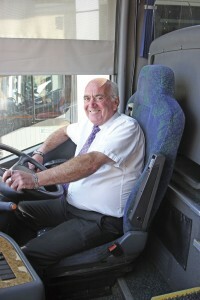 A coach driver for 30 years, he had previously driven buses and before that trucks. He admits that he didn’t originally want to drive the Touro because he considered himself ‘old school’ accustomed to changing gears on the revs with a manual. ‘Now I wouldn’t go back to a manual,’ he said. ‘It is smooth if you let it be, but if you try to race it, it isn’t – but then you shouldn’t be racing coaches anyway. The gears are well spaced. It never jumps about like on the I-Shift. It is that smooth that you don’t notice when it changes up and down. Dave Brown has driven the 2005 Touro since it was new and wouldn’t want to go back to a manual. ‘With the brakes, the intarder works perfectly and reduces brake use on hills. I’ve never had a brake problem even though you use them more on an auto. The halt brake is useful and stays on until you accelerate. You have to flick it on and off. If you leave it on it doesn’t go anywhere.’ Matthew prefers this to systems that go off after a number of seconds. In his experience passengers have always liked it. ‘I’ve never had any bad comments about the ride’, he said. ‘There is the occasional air conditioning complaint. The system is very efficient, sometimes too efficient. The system will get it really cold if you want it to, all the way down to 16 degrees. There is a separate driver’s air system.’ Matt mentioned passengers liking the fact that there are plenty of grab rails when they are getting on and off, and the fact that adults use the lap belts while children are supposed to but don’t. 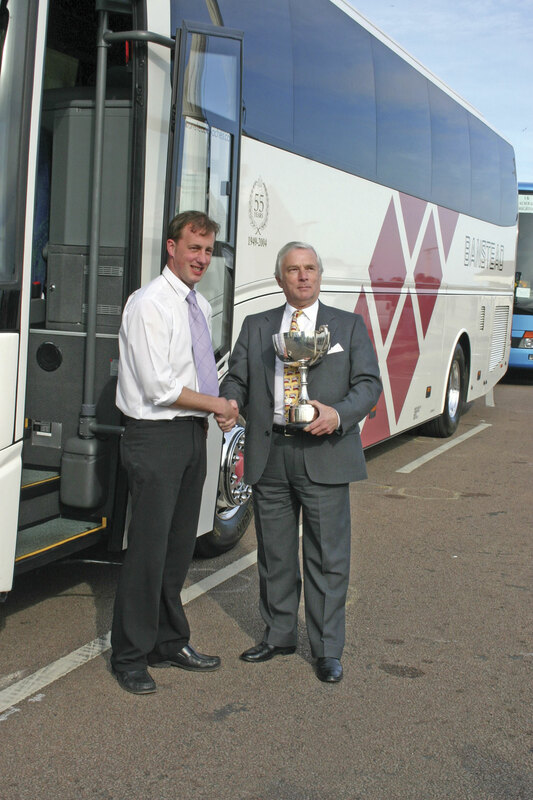 ‘I was offered a newer coach last year, but I chose to keep this one. I’ve only got a couple of years to go,’ Dave concluded. Banstead’s coaches don’t cover particularly high mileages, the first of the trio having covered only 465,206km at the time of my visit despite being in its 12th season. They don’t go abroad very much and if they do, it will probably be either to Paris or taking school children to Ypres. Looking after the maintenance of the coaches alongside Dudley Haynes is Gareth Scott who was equally enthusiastic about the Touro. ‘I love them, they’re marvellous. I’d like more of them. They relatively simple and most stuff is accessible,’ he said, which was pretty unequivocal as an opening comment. All three Touros are fitted with the 12-litre, Mercedes-Benz OM457LA engine unit. A little book is kept on every bus in the fleet in which notes of any work done, what was changed and when and servicing dates as well as any part numbers used, are kept. The one for the ’04 showed that it had broken down a couple of times with air related issues, though Gareth claimed that the Dennis’s had been worse for air problems. In the saloon, Gareth has found the biggest issue is the interior lighting. ‘They are too dim, they are bolted on afterthoughts rather than integrated, they are very expensive and they don’t last long. It is the same on the Tourismo. They really should have moved on’, he said. To address the problem Gareth has replaced some units with LEDs. Built in Portugal by CaetanoBus, the Touro has a hint of Caetano Enigma styling about it. In terms of tyre wear, they are ‘a bit heavy on the front tyres where the shoulders go’ though the backs wear very well. Putting the air issues in context, Dudley pointed out that all coaches have them. Similar issues in the B9R had been traced to air in the compressor. He likes the Touros and is pleased that they opted for automatics ‘because you don’t have to worry about clutches’. ‘They are so simple,’ he said, ‘We change the gearbox oil regularly at around 120,000km.’ In contrast, engine oil is changed annually with synthetic oil used. They don’t keep specific fuel consumption figures at present but believe the Touros are doing approximately 8mpg around town and 10mpg on a run. With the Touro, you have to remember to lower the ferry lift facility when entering the workshop because at 3.75m high it is marginally too tall to go in without damaging the roof mounted Konvekta air conditioning system. Banstead’s Tourismos, 10cm lower at 3.65m, will go in at their normal ride height. For the 2007 season EvoBus discontinued the Touro. ‘I would absolutely have bought more Touros if they had been available,’ said Matthew. As a result of their non-availability, a Volvo B12B with Plaxton Panther coachwork was purchased, although this time it arrived fully loaded with the features that had been so attractive on the Touro (except the three-pointed star). By the following year, Mercedes-Benz was able to offer the Tourismo and based on the Touro experience, Banstead took one. 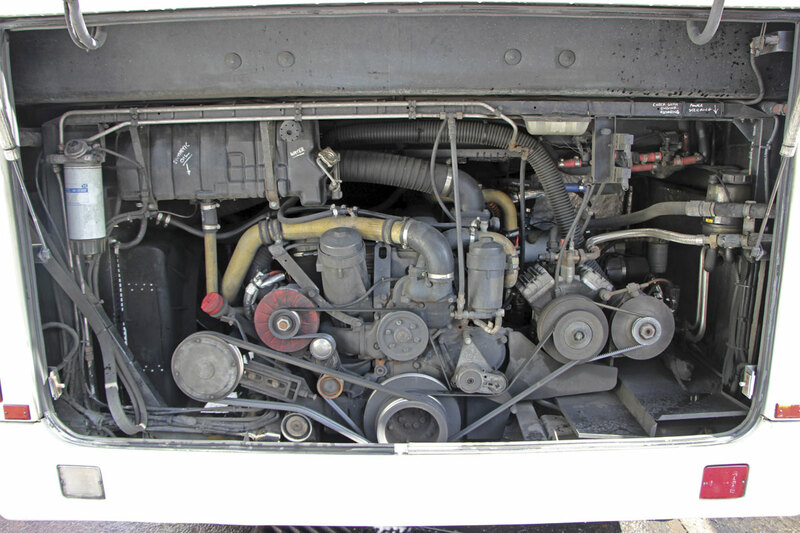 The gearbox problems have been mentioned earlier and it was this aspect of the vehicle that prompted the buying of another Volvo Plaxton, this time a B9R Panther, in 2009. When Mercedes-Benz were able to offer an automatic, in the shape of the Powershift box, they returned to the Tourismo in 2010, though subsequent new acquisitions have been a trio of Beulas Spica bodied MANs, the first on the 290hp powered A91 chassis and the later two on the 360hp RR8. Two secondhand Van Hool T9 DAFs have also been bought to bolster the lower end of the fleet. Luggage capacity and accessibility is a strongpoint. The doors are powered. The Touro isn’t the lightest of coaches, it never was. I remember noting that some of the earliest examples tipped the scales at 14,280kg, which severely limits your scope for carrying luggage with a full load of passengers. Banstead’s examples are somewhat lighter, two being certified at 13,660kg and the third at 13,700kg. If you do a lot of heavily laden work it is worth bearing in mind. On the basis of Banstead’s experience, there is a lot to be said for the Touro as a straightforward, reliable, workhorse that is relatively uncomplicated to maintain. 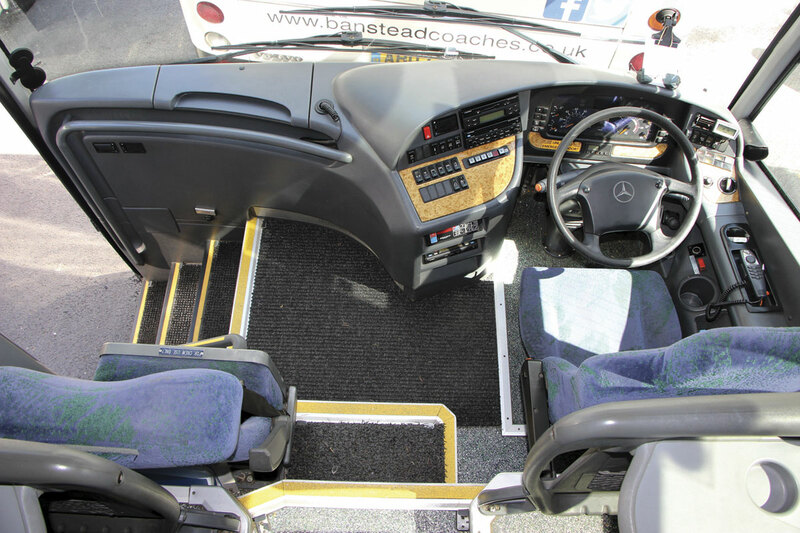 Unlike the Banstead trio many are 49 seaters with centre continental doors and sunken toilets, and as they get older these will probably be slightly less desirable than the straight seated examples. With the success of the Tourismo in recent years convincing Daimler that you don’t have to offer body/chassis combinations to satisfy the UK market, I think the Touro is likely to be the last chassis mounted full sized coach that we will see being directly offered by EvoBus UK, though I believe you can still buy the Caetano Levante bodied OC500RF for National Express work.